New book, 64 pages, ELI189. Longbows, crossbows, heavy spears, swiss pikes, catapaults, and especially gunpowder artillery and handheld guns such as the arquebus gradually but profoundly changed European warfare. By about 1260 the steady rise of the European heavily armoured mounted knight to the predominant role in most pitched battles was complete. But though he dominated the actual day of battle, he did not dominate warfare - there were plenty of vital though unglamorous tasks for which footsoldiers were still necessary, 'cleaning up round the edges'. With the development in the 13th century of co-operative tactics using crossbowmen and heavy spearmen, deployed together to compensate for each others' vulnerabilities, circumstance began to arise in which the charge by Muslim horse-archers, and then by European armoured knights, could be defied. Infantry were far cheaper and easier to train than knights, and potentially there were far more of them. Slowly, tactics emerged by which more numerous and more varied infantry played an increasing part in battles. The best-known examples of this 'democratization of the battlefield' are the English longbowmen who won battles against French knights in the Hundred Years' War, and the massed Swiss spearmen and halberdiers who did the same in wars against the Dukes of Burgundy. 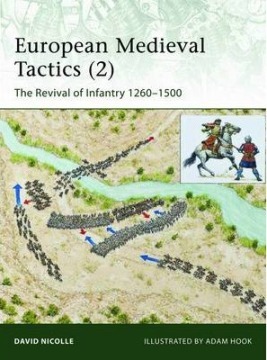 Illustrated with specially commissioned full-colour artwork depicting the tactical formations of the era, this book traces these and other examples of this 'jerky' and uneven process through its regional differences, which were invariably entwined with parallel cavalry developments - the balanced army of 'mixed arms' was always the key to success. By the time serious hand-held firearms appeared on battlefields in large numbers in about 1500, the face of medieval warfare had been transformed. This item was added to our catalog on Saturday 06 April, 2013.